“Cultural & Culinary Tour” offer our travelers an absolute indulgence of all five senses. In this fascinating journey, you will have a unique opportunity to not only experience the priceless wonders of Myanmar, but also a chance to bring back Myanmar’s best-kept culinary treasures to share with family and friends at home. Sitting at the crossroads of the great civilizations of India and China, Myanmar brings new meaning to an exotic, mysterious journey. You are sure to be captivated by the ancient Burmese civilization explored through this distinctive and diverse culinary adventure. At the heart of it all, you will ramp up cooking experiences to extraordinary, starting in Yangon. Unique and stimulating cooking experiences continue throughout your journey including a rare opportunity to cook in a family kitchen, assisted by village cooks who will personalize your culinary adventure; then you dine with the family in a Northern Burmese home. Your taste buds will go over the top, far off the tourist track, with visits to tea houses, people’s markets, a rice noodle factory, a winery, floating vegetable gardens, traditional local breakfasts, and everywhere, meals at authentic Burmese restaurants. There is much to experience during this journey to the Burmese heart and soul of Myanmar. 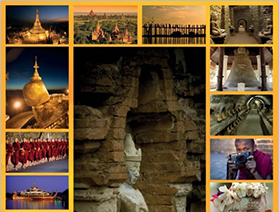 This exquisitely adventure to the heart of Myanmar is designed for small group for 10 Days trip. If you are individual/couple or even family and want to add culinary experience to your itinerary we can easily customize. Take home Myanmar’s best-kept culinary recipes to experiment with and share! Every time you chop and stir, we guarantee your kitchen will be filled not just with intoxicating aromas but the indelible images of your journey to the heartland of ancient, exotic Myanmar.